Feeding Horses with Less than Perfect Teeth! Poor dentition is not just a problem for older horses; diastemas, the abnormal gaps between teeth, are being diagnosed more frequently in horses of all ages. Horses with dental issues usually require careful dietary management to ensure that further problems such as weight loss or digestive upsets don’t occur. Forages normally make up at least half of most horse’s diets and so make a significant contribution to the horses overall requirements. To find out just how big an effect poor dentition would have, Dengie ran a study to investigate how much less horses with poor teeth could consume. The trial involved 12 horses and it was found that horses with poor dentition consumed about two-thirds less than those with normal teeth in a given time period and actually refused to eat the hay on a number of occasions. 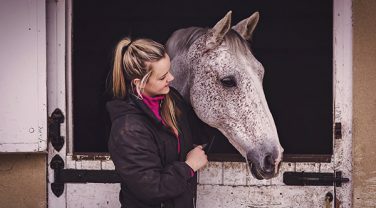 It is vital to provide fibre in a form that the horse can eat to ensure that normal gut motility is maintained and to ensure the horse consumes enough energy and nutrients to keep them in good health. Dengie Meadow Grass with Herbs contains high temperature dried grass mixed with cold-pressed rapeseed oil and herbs. The grass is harvested when it is young and very digestible – in contrast to grass hays which are allowed to matrue before being cut. This makes the grass in Meadow Grass with Herbs more digestible and easier to chew, particularly as it is chopped into short lengths about 2 to 4cms long. If you horse isn’t overweight and isn’t prone to or at risk of laminitis then Dengie Meadow Grass with Herbs can be fed at 1kg per 100kgs bodyweight as a hay replacer. This supplies a significant amount of oil so we would recommend not feeding any additional high oil feeds. It is important to check how much your horse is consuming so you can be sure they are eating enough. The very least any horse or pony should consume is 1.5% of their bodyweight in high fibre feeds per day. This equates to 7.5kgs for a 500kg horse. Is the sugar level ok? The sugar level in Dengie Meadow Grass with Herbs is 12% which is about the same as an UK grass hay. This means that if you would have been feeding hay to a horse that could manage the longer length forage, the Meadow Grass with Herbs should be an acceptable alternative. In some cases, even a short chop forage is too much and so Dengie Grass Pellets are the product to turn to. They are simply grass that has been ground and made into a pellet – effectively pre-chewed! They can be fed dry but feeding them damp or soaked makes them a lot easier to chew. It is possible to mix some of the Meadow Grass with Herbs in to the pellets if the horse can manage a little bit of chopped fibre and it is also possible to feed them mixed with a soaked beet product such as Dengie Alfa-Beet to create a mash that is full of highly digestible fibre. Dengie Grass Pellets have a DE value of 10MJ/kg and so will help to promote weight and condition. They can be fed in a large trug and left with the horse to pick at as they would a haynet. 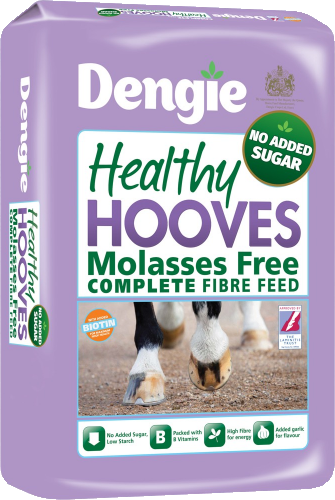 If you need some nutritional advice for your horse or would like to know more about any of our products, don’t hesitate to contact the Dengie Feedline team on 0845 345 5115 (charges may apply) or chat live to a nutritionist.